In part one we discussed how the Passover laws changed, and gave examples. The Rabbis and the critics, naturally, are alert to these differences, of course, and offered solutions. Here are some of them. (1) Why does Exodus command us to bring a kid or lamb, while Deuteronomy says anything from the flock or herd is ok? Rambam reads it this way: And you shall offer the Passover sacrifice to the LORD your God,[FULL STOP] from the flock or the herd [Take a Chagigah offering] at the place that the LORD will choose, to make his name dwell there. (2) Why does Deuteronomy order us to use the precise cooking method that is specifically forbidden in Exodus? Verdit: Eh. In Divrei Hayamim, the cooking method is qualified as Bishul IN FIRE. That qualification is not used in Deuteronomy. We're still left with the original problem, namely that the word Bishul with no qualification is prohibited in Exodus, but commanded in Deuteronomy. Also, as the verse in Divrei Hayamim continues we see that Bishul without the qualification, clearly means "boiled in water"
(3) Why is it a private, home sacrifice in Exodus, but a communal gathering in a centralized location in Deuteronomy? Because the home sacrifice was a one time only affair, and never intended to last for generations. There Exodus Pesach sacrifice is not the same - nor was it intended to be the same - as the Pesach we celebrate afterwards. Deuteronomy is telling us what to do in the future; Exodus tells us what happened on one specific night in the past. Verdict: Fine, but not clearly represented in the text. By the time Deuteronomy was written (by someone who lived while the Temple stood) the theological circumstances had changed. Home ceremonies had been banned, and the religion had been centralized. (See 2 Kings 23 where this reform is described) The description in Deuteronomy reflects these changes. Remember that Deuteronomy was "found" by Hiklia during the beginning of Josiah's reign; immediately thereafter the king says " “Celebrate the Passover to the LORD your God, as it is written in this Book of the Covenant.” and the narrator confirms: "Neither in the days of the judges who led Israel nor in the days of the kings of Israel and the kings of Judah had any such Passover been observed." -- perhaps because until that point, the home-based Exodus Pesach was observed, while this was the very first time everyone came to Jerusalem for a Deuteronomy-type communal celebration. From the account in Divrei Hayamim its clear that the offerings were boiled in water by the Levites so that it could be distributed quickly. Picture the event as a communal tail-gate. What is not clear if if the Passover was boiled, or if it was the Chagigah that was boiled. There's ambiguity in the verses. Verdict: Eh. Its a grand theory, but it doesn't completely satisfy me. Just because it might be right, doesn't mean it is right. In Parshas Bo (Exodus 12), Moshe receives a whole host of laws governing the conduct of the Passover sacrifice. Forty years later, these laws are reiterated and recorded in Parshas Re'Eh (Deuteronomy 16) with some significant changes. Roast the sacrifice whole over an open fire. Don't break any bones, and don't cut the meat. After the meal, stay in your house until morning. (12:22 None of you shall go out of the door of his house until the morning). The Rabbis and the critics are alert to these differences, of course, and offer explanations. We'll discuss their solutions in the next post. Several people who watch the Fox Television show New Girl let me know that our shul was in the frame for a few seconds. Very cool. Here is your proof! Venice Beach was the key prop in a scene where one character (Jess) tries to help another character (Schmidt) relax. There is no where in the world to find more relaxed people than Venice Beach. It's a great place to let go of your troubles. Although, the drum circle people who are dancing in the show bear little resemblance to the actual drum circle people. Clearly, casting preferred to portray them as a group of people with above average looks who don't need a shower. This is not entirely accurate. If you need a Shabbos of relaxation come to see us on Venice Beach. The family appears to be celebrating Passover... only what's that leavened lump at the center of the table beneath the challah cover? “Girls are getting killed on the Internet — that’s the reason for it,” Benzion Stock, administrator of the Crown Heights school, told The Post. Right. Girls are getting killed on the Internet, and Facebook is the reason.Glad that's straightened out. Can I say what everyone is thinking? Liz Roberts, leader of the attempt to ban Israeli products from the Park Slope co-op is an idiot. Oh. Was that too blunt? Look, I'm no fan of Israel's policy of collective punishment of Palestinians but the answer isn't to collectively punish Israelis. Boycott goods produced within the settlements if you wish, but why divest from companies that operate on the democratic side of the green line? How did I win any arguments before Google? Re: The midrash about the non-singing angels and whether or not its author was attempting to humanize the dead Egyptians. Her: We're allowed to sing! Only the angels were banned from celebrating! Not us! Me: Yes, and I agree with you that the midrash, as we have it in BT Megillah, is not telling us anything about the humanity of the Egyptians. The lesson, as recorded by its purported author, is simply that God "does not rejoice at the downfall of the wicked." Her: But bear in mind, God told the *angels* not to sing praises. Not us. We *do* sing praises when those who have oppressed us fall. Another guy: I have to ask, do you really believe-that there is no lesson for and about human beings in the midrash? About how we ought to emulate God in tempering our joy at the downfall of the wicked? That we ought to be careful to rejoice with total abandon at their suffering, perhaps especially because we ought not to condemn them all equally--the complicit with the instigators, the redeemable with the wholly irredeemable? Her: Yes, I really do believe that... There's a verse in Proverbs that says "do not rejoice at the fall of your enemy." This is discussed in the Talmud, where it is specified that this means a Jewish enemy or opponent. In Tractate Megillah, this is even illustrated by an aggadeta about Haman and Mordechai where Mordechai uses Haman as a step stool to mount his horse, and Haman says, "Doesn't your Bible say not to rejoice at the downfall of an enemy?" whereupon Mordechai points out that this doesn't refer to non-Jewish enemies. Her: If I'm a little strident about it, it's because I'm so godawful tired of hearing people twist the Torah into a touchy-feely liberal parody of itself. I have to admit: I thought she had a point. See, I do agree that this midrash isn't about the humanity of the Egyptians. (though I, hasten to add, I don't find anything inauthentic about the liberal interpretation of the interpretation. Everything worth keeping gets reinterpreted by its heirs as they filter it through their own perspectives and experiences.) Then I remembered one of the neat things about biblical exegesis: If it sounds reasonable, you can probably find a bold-faced name who said it first. So I went to Google, and hit pay dirt on the first page of results. And in the Shibolei haLeqet it is written in the name of the Midrash Harninu that the reason why we do not finish Hallel on all the days of Pesach [only on the first] is because the Egyptians drowned. As it says “do not rejoice at the fall of your enemy ” (Proverbs24:17). So, the verse you insisted could only refer to JEWISH enemies, is in fact used by the Bes Yosef to explain why we don't finish Hallel on the seventh day of Pesach. He seems to think the midrash contains a lesson about the humanity of the Egyptians and how we lose some of our own humanity when we fail to recognize theirs [For the record, I still think he's reading in] So let me leave you with my opening questions. 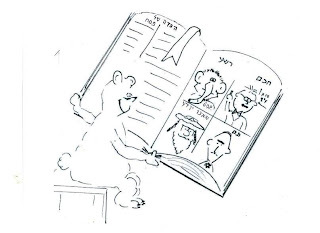 Is the Bes Yosef "twisting the Torah into touchy-feely liberal parody of itself?" Please answer. When did England become the worst country in the world? What Stacy did was this:. After seeing Fabrice Muambo collapse on the field during a soccer game, he let his followers know he was happy to see Muambo go down, and hoped he was dead. [Actual Tweet: L"OL, **** Muamba. He's dead." When people protested, Stacy retaliated with a series of ugly, racist comments. Eventually the police were notified, and because Britain has no violent crime, Stacy was investigated and imprisoned. Stacy's behavior should not be forgiven, but a jail sentence? For being an idiot? DovBear doesn't approve. Ever wish you could read the Iliad in the original ancient Greek that Homer wrote in? What about Beowulf? Can you read the old English? Do you wish you could? There's a well known Assyriologist in my neighborhood that I've gotten to know. He & I both attend a Shabbat afternoon study group, where he can be depended upon to mention obscure ancient texts that are relevant to the chumash we're discussing. And he's read these texts in their original languages. Last week I was thinking how cool that would be. If only I could read Akkadian too. It's a remarkable thing to be able to comprehend an ancient text as it was written, without the veil of translation standing in the way. Then I realized that I do have that skill. Tanach, roughly contemporanous with Homer, is an ancient document and I can read it in the original biblical Hebrew. I can (and do) actually spend time with the text and look for patterns and anomolies. It's called studying the Torah and anyone with a Jewish education has that skill. I may not be able to read Beowulf, but it's roughly contemporanous with another ancient text, the Talmud, which I do have the ability to read (though sometimes I need Rav Soncino or Rav Artscroll's help.) I understand what's going on in that Hebrew/Aramaic mix and can see the intricacies of the legal and Aggadic language used. That's pretty darn cool. My Yeshiva education left me with a lot of things I strongly dislike. Lack of critical thinking, blind faith, and numerous disturbing prejudices, which I've thankfully shaken in adulthood. But the ability to read certain ancient texts in the original is a pretty amazing thing, which in other disciplines is usually part of PhD work. The fact that I, and most of you with day school or Yeshiva educations learned this AS CHILDREN is a pretty amazing thing, and makes me realize that along with my resentment, I also owe my chilhood Yeshivot a huge debt of gratitude and hakarat hatov. - In the British territory of Gibraltar, Jews actually mix the dust of bricks into their *charoset*, a symbol of the mortar used to hold together the brick walls the Jews built in Egypt. - Coca-Cola makes a special batch of kosher-for-Passover Coke with real sugar instead of high-fructose corn syrup, because corn products are forbidden during the holiday. Look for the bottles with yellow caps. - Centuries ago during Passover, Jewish people living in the Sahara abandoned their fortified villages and marched into the desert, in memory of the first Passover. How do we know the angels were silent at Kriyas Yam Suf? Marvelous, is it not? What other tradition recognizes the shared humanity of its enemies? Who else, but the Jews, would pause to recall that those who would enslave, murder and main are God's creatures, too? Like you, I grew up thinking of this story as a remarkable example of rabbinic humanism. Now, I am not sure. Warren Buffett got a bottle of Scotch, a loaf of traditional Jewish bread, a bag of Cheetos and the rights to the food in three large drums and a box, during his fake re-enactment of the sham sale we Jews do every year when we pretend to get rid of our leavened bread. Read more here. How easy is it to shoot someone in Florida? Catching up with L'affaire Zimmerman, and it seems to me that Florida's Stand Your Ground Law makes murder a little to easy. I mean is this all it takes? All you have to do is wait till its dark and rainy next time you feel like shootin anybody (male, female, child, elder), call 911 and say I see someone who looks suspicious, walk up and grab the person. When they struggle to get out of your grasp you shoot them dead and then wait till the cops arrive to exonerate you on the spot when you say, "She attacked me, it was self-defense". Florida. Do sinning and leading always go together? Interesting bit of two-way Torah this week in Lev 4. The chapter discusses sin offerings brought by various categories of people - the individual, the community,the priest, and the leader. "When ("asher") a Prince shall sin etc." Chizkuni: Ditto. For slightly difference reasons. Rashi: The word used for IF is asher which puns on the word for "fortunate". The verse is REALLY saying the a generation with a leader brave enough to admit his mistakes is a fortunate one. Seforno: You can't lead without sinning. One follows from the other inevitably. Ibn Ezra was a wandering poet; Seforno was himself a political leader. Perhaps their readings of the verse were influenced by their respective biographies? What do we do with Rashi? His comment doesn't really solve the problem does it? What prevents him from taking the discrepancy at face value, and saying that leaders inevitably sin? Again, I find myself thinking about the time and place that produced him and the sort of life that he led. He was not a political leader himself, but he lived at a time when kings were thought to be above criticism. Anything a king did was ipso facto the right thing to do. Perhaps he saw what Sefrono saw but, owinig to his particular Weltanschauung, couldn't quite accept it? And let's not rule out the possibility that Ibn Ezra and Chizkuni are the ones who are correct here. Perhaps Seforno found something in the verse that's not really there. Sure, we moderns are perfectly comfortable with the idea that leadership leads inevitably to corruption, (Thank you Lord Acton) but who says the Torah sees it that way? Maybe the verse really isn't making any special point about a king's extra susceptibility to sin. Are These Photos of the Same Religion? 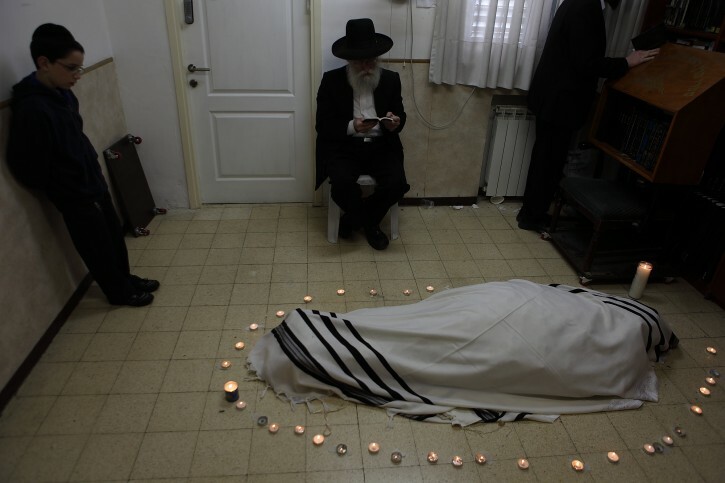 Last week the Jewish world mourned the loss of the Vizhnitz Rebbe, Rabbi Moshe Yehoshua Hager. Today, the Jewish world mourned the loss of the Rosh Yeshiva of Torah Ohr, Rabbi Chaim Pinchus Scheinberg. The Atlantic and Huffington Post are arguing the merits and demerits of home birth. The Atlantic says they are (often) dangerous, and dumb. Huff says so what: Some women find them less stressful and more comfortable, plus doctors are morons who just want to cut our stomachs open. I know I don't have a uterus, but can I speak bluntly? The Atlantic wins this one. I agree that many deliveries are not complicated, and can be performed safely at home. I also agree that some doctors are bullies who prefer procedures to sensitive sitting around while they wait for something to develop. However, none of this justifies the risk you take when you choose to deliver your baby at home. Most deliveries go smoothly, but should complications arise you might have only a few minutes to act. If you deliver in a hospital everything needed is at hand, and a doctor can act immediately. But if you are delivering at home, and something goes wrong, the drugs and surgical expertise are not nearby, but at the nearest hospital, and you may not have enough time to get there. My own wife fell under the spell of some voodoo faith healer, and opted to deliver our first child without the benefit of pain killers. It all went well, but by the time she delivered again, we were both much smarter. She delivered our next child under the influence of that heavy pain killer that knocks out your lower body.Do you know why? It wasn't because she couldn't handle the pain, but because she knew the doctor might have seconds to act if an emergency C-Section was required. Pain killers work quickly, but she didn't want our unborn child's life to be at risk for an extra moment or two while the doctor waited for the anesthetics to kick in. Hey, thanks for bearing with me, during these unusual times. I think we'll be back to regular posting soon. A recent article on a frum news website accompanied a photo essay of a last minute wedding. The article is meant to be an uplifting piece about two "older" frum singles that found each other. The only problem is that instead of feeling uplifted, I felt disturbed. Here's the article and my fisking. Yes, I'm a little mean here, but this article really pi**** me off. I'm sure that these 2 are lovely people and hopefully they'll be happy together. This past Tuesday, I witnessed and partook in one of the most special and extraordinarily meaningful weddings ever--in my humble opinion. It blasted away such blanket statements made, in particular, about older singles who are often criticized for being finicky and inflexible. It was an impromptu wedding ceremony; the chasan is 57 year old Arthur Levine, a native Baltimorean, and his kallah is 31 year old Rivka Talia McDonald--Arthur had never been married before. I, along with most all of the wedding “guests”, had never met the chasan and kallah until about fifteen minutes prior to the chupah. 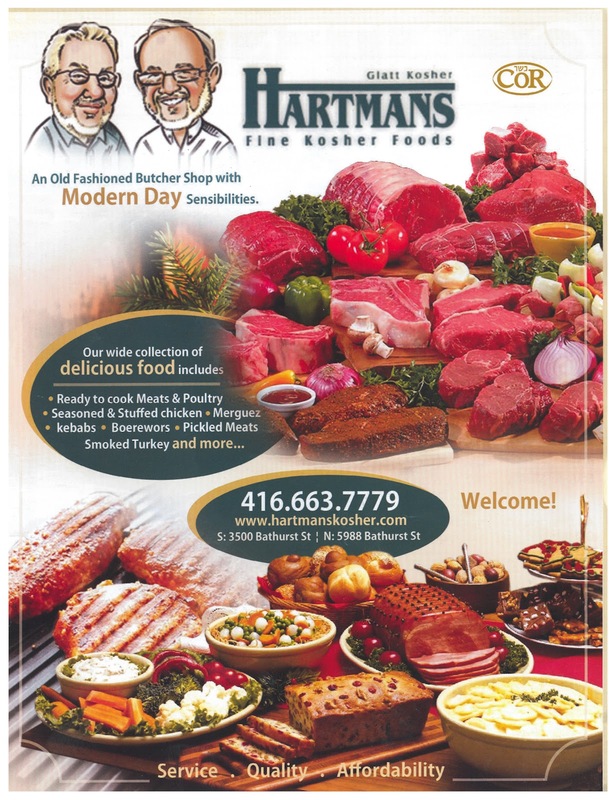 It was officiated by HaRav Chaim Geller, shlit”a, who has been Arthur’s posaik for 37 years. > Yup - a perfect match, both older singles! TOTALLY appropriate match. After all, she's not just over 25, she's OVER 30, practically ancient! Basically the same age as her groom. What's a 26 year difference of age? Arthur and Rivka’s shadchan was none other than the veteran crackerjack matchmaker, Chedvah Goldberg. She came up with the brainstorm---just 6 weeks ago. > 6 weeks? Sure, that's more than enough time for them to get to know each other & get married! And after all, at 31 she had one foot in the grave - they couldn't afford to wait. > This gets better & better. She's a new convert, subject to brainwashing. Meanwhile, he's a delusional middle aged man who refuses to date anyone over 35. Most guys like that aren't subject to admiration but are rather viewed as creepy, and most women won't date them. Arthur was rockclimbing and paragliding, in South Africa, at the time, when the email arrived. Mrs. Goldberg suggested that prior to her setting up a date with Rivka, Arthur should fly straight to Israel, where Rivka’s rav, Rabbi Schneider lives. The rav and Arthur met; Rabbi Schneider not only approved of Arthur, but was crazy about him. > Then Arthur got down on one knee and proposed to Rabbi Schneider.... Oh, wait - that's not where this is going? The engaged couple’s flexibility and easygoing natures were proven when the wedding, which was originally planned to take place in Florida, took place in Baltimore, with not more than five or six hours notice. To pull this off, an instant minyan was needed--and found--within an all-Orthodox workplace, in our community. Arthur and Rivka had to catch a 5 p.m. flight back to Florida, so while everyone in the office was scurrying around attending to all the other details needed for the instant post-chupah seudas mitzvah, Arthur presented Mrs. Goldberg with a shadchanus check. It was made out for a nice sum, which he had promised her, five years ago, if she were to find his besherte. As is this matchmaker’s custom, it will go entirely to tzedaka--that same day, it was sent to a yeshiva for baalei teshuva, in Israel, which one of her sons-in-law heads. “He’s a man of his word; I never thought it would happen!”, said Mrs. Goldberg, after Arthur handed her the check, proudly posing for the wedding photographers with her reward in hand. Prior to the chupah, HaRav Geller explained the terms of the ketuba to Arthur, during his non-conventional chasan’s tish. Subsequently, on cue, four of the male guests held the broomstick poles over which was draped the new tallis given to Arthur by Rivka; it served as their wedding canopy. 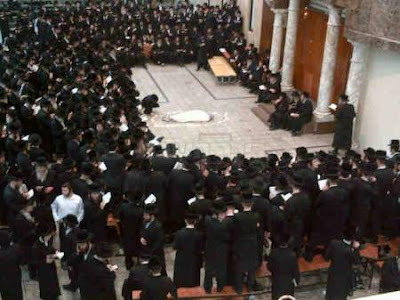 Arthur took his place, under the chupah, while a friend, Yona Stern, sang ‘Mi Adir”. There was no long procession; the kallah was accompanied to the chupah, a few feet away, by Mrs. Goldberg, who guided her in circling the chasan. Both Arthur and Rivka were dressed as if they were going on a casual date---he, in a blue open neck shirt-sleeved button-down shirt, and she, in a camel colored cable knit pullover sweater, adorned by a silver floating heart necklace. It was a match made in heaven! The chupah ceremony was light and joyous, with the chasan confirming that the wedding band was bought by him- and then joking that it was made in China. At the chupah’s conclusion--it ended with Mr. Stern’s rendition of the German ‘Shir Hamalos’--the elated guests, still in a state of shock, fervently sang and clapped to ‘Od Yashama’, unaccompanied by the usual band. The newlywed couple then retreated into their makeshift yichud room, which most probably was decorated with Inner Office Memos, and the like. Of course, with little time to spare, the employee-guests did not have the often extra-long wait time before eating the sumptuous Chinese wedding feast. During the wedding meal, Arthur made a touching speech, in which he expressed his deep feelings for his kallah. By the third date, he related, he knew that Rivka was his besherte, but he had never proposed. Is this not a great poster? Its from 1973, and I found it available for purchase on the same auction site that's offering lunch with Mo Vaugn (post below this one). Nowadays, the organizers would have probably done something ugly and forgettable in MS Word. A shame, because fantastic commercial design like this really packs a wallop. At Dead Spin, a post snarks on Russian Jews for offering lunch with Mo Vaughn as a charity auction item. I agree that lunch with Mo Vaughn is not something a sane person might pursue. However, it has the merit of being something tangible. At least you actually get to meet the faded superstar over an actual plate of food. Other Jewish charities offer their supporters imaginary benefits like magic coins, rote blessing, and the like. Let's all say a word of thanks that the snarkers at dead Spin haven't come across any of that. I read this excellent article on Tablet today. It's a great article for a lot of reasons. For me, the best part of the article is that I agree with almost every word! (Half kidding.) For the purposes of this post I will assume you have also read the article. Click here: Tablet Magazine, read the article and come back when you are done. The writer, a young woman studying at Stern College, comes from a more insular background than the Yeshiva University environment she now associates with. Her accounts of life in the more insular community are accurate and I myself have experienced many of the same sentiments first hand. I have heard of almost all the rest of them second hand. Many of you are pointing out that Cross Currents is once again blocking comments -- this time, comments that present the views of Rishonim. Alas. The post in question is yet another in a series of posts on various blogs written by people who think that by failing to understand Rashi, they are bringing glory to his teachings. In this particular case, the writer brings up Rivka's age, and seems to suggest that only a mechutzif would disagree with Rashi's claim that she was three years old on her wedding day. Anyone else would tremble, and shake, and accept what he was told. Problem #1 is that Tosfos and Ibn Ezra among others have already disagreed publicly with Rashi. So how can it be wrong to study and teach their arguments? Moreover, how can it be wrong to teach Rashi in context? Yes, he said Rivka was three, but if you stop there, and close your ears to what other authorities said you haven't finished the sugya. Problem #2 is that Rashi wasn't necessarily trying to teach history. He wasn't saying that Rivka was three years old, as a matter of historical fact. He was saying that based on his own close reading of verses, it seems to him that assigning this age to her is the best interpretation of the text. There is an important nuance here, one that escapes people who think they are doing God and Judaism a favor by making outrageous claims in their name. Tremble and shudder all you will, but you pose no salve and no solution for the problem that many Jews cannot tremble before Rashi the way your rebbe trembled before R. Boruch Ber (he did say R. Boruch Ber was incorrect, mind you, even while trembling). What do you suggest we do for them when your preferred approach will not work? What about the Ramban’s model of “open rebuke, hidden love” which he displayed toward Ibn Ezra, rather than trembling? Or Rashbam’s testimony that he challenged his grandfather over not achieving the goal of a pshat commentary, and that Rashi told him that if he had the time he would write such a commentary? These are, I believe, possible alternate models for those who will not tremble. Though I restrict myself here to the question of Rivka's age, everything I have said here applies to almost any Rashi. There are almost always Rishonim who disagree with him, especially when he is at his most fantastical; more importantly, it is never correct to defend an opinion -- even a Torah giant's opinion - by accusing your opponents of bad manners. Make an argument, instead. Should we forgive General Grant or not? Over at Slate Jonathan Sarna, the distinguished historian of American Judaism is arguing that the worst thing Ulysses S. Grant ever did was one of the best things that ever happened to American Jews. Grant, as you might know, was responsible for the only expulsion order in American history. On December 17, 1862 he tossed the Jews out of the military district he controlled on the grounds that Jews, as a class, were aiding smugglers and violating trade regulations. (1) His persecution strengthened the Jewish community as the successful campaign to overturn the order made us more self-confident. (3) He supported persecuted Russian Jews. I suppose all of that is nice enough; still, signing an order to toss Jews out is not easily forgiven. We Jews know we are not supposed to count people. But why? Chief Rabbi Sacks says counting people generally leads to only one of two possible outcomes. After a count, you will either you see you're outnumbered and succumb to despair, or you'll see the people are with you and become vulnerable over-confidence. This, continues the Chief Rabbi, is why we were commanded to conduct our census by making a physical contribution of money. The lesson is that raw numbers don't matter. In a battle of any kind, all that counts is what the people you have are willing to do. This powerful message is brought home in Judges 6. In the strangest and most unlikely battle story of all time, where God teaches Gideon that we can't beat Midian with 30,000 soldiers. It can only be done with 300 men. A small army of hard workers will always our perform a horde of underachievers. 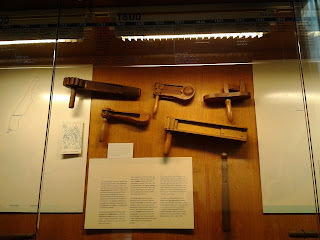 I went to the NYPD Museum in downtown Manhattan this past Friday. Imagine my surprise to have stumbled across the "Hall of Groggers." 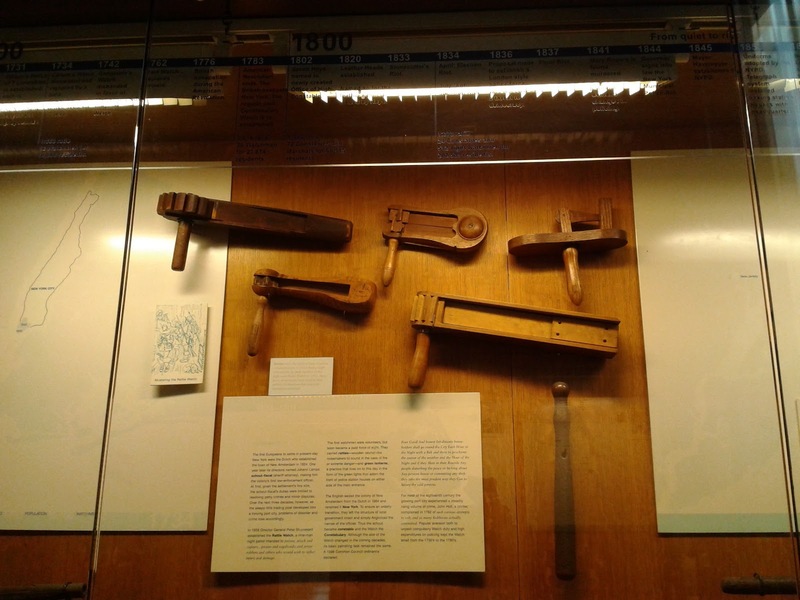 Apparently, the "Grogger Task Force" dates back to the days of Peter Stuyvesent, when the rattlers were the primary tool of law enforcement in New Amsterdam, and they persisted in New York for centuries. From 1609 to 1664, eight Dutch colonists carried lanterns and wooden rattles as they watched over the streets of their colony. 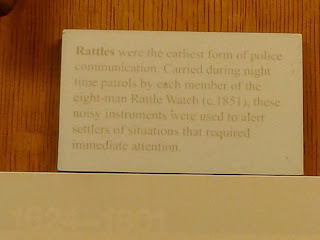 The rattles were pre-whistle noisemakers that would alert members of the community to crime, fires or other threatening situations. The lanterns the men carried were made of green glass—this helped identify them to citizens. The green light became synonymous with aide and assistance and to this day, green lights are lit outside the entrances to Police Precincts in homage to the men of the Rattle Watch and to reassure citizens that the police are on duty. 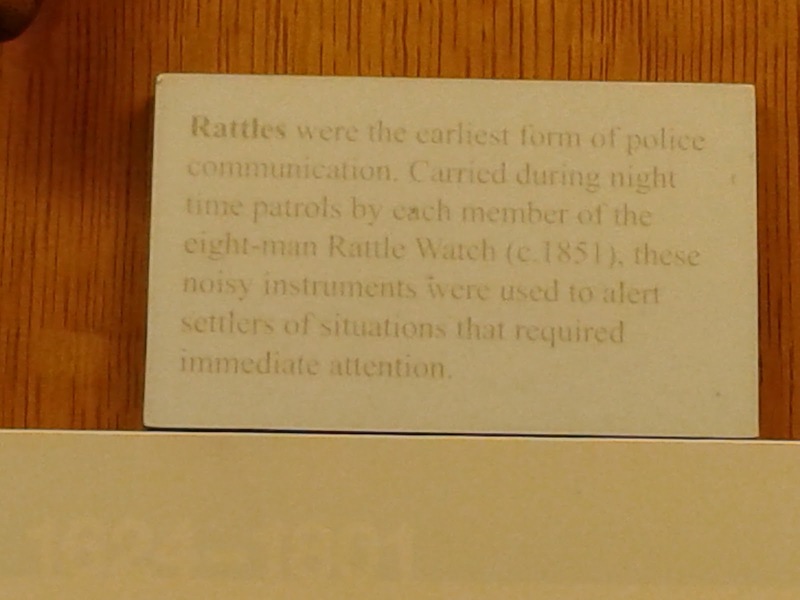 It would be over 150 years before the NYPD was officially created, but many of the traditions started by the Rattle Watch remain today. Why wasn't the first party co-ed? Why didn't the Greeks, Persia's traditional rival, take over the kingdom when everyone important was partying in Shushan? Why didn't the king blink when Haman asked for permission to murder millions? Why didn't the King take Haman's bribe? After throwing all those parties, he didn't need some spare change? Why did Haman need to build a gallows for Mordecai? Couldn't he just hire the firm of Two Guys Named Vito to settle the score quietly? Why didn't Esther accept the King's offer of half the kingdom. He made it twice, so we can assume he was serious. Why did Esther drag Haman and the King to a second party? Couldn't she have ratted out Haman at the first party? Why did Charvonah have such a big mouth? And if he had it in for Haman, why did he wait until the last minute? Why did Mordecai get Haman's job? What were his qualifications? Is that how it worked in Persia? If someone plotted to kill you and your people, did you automatically take his position when the plot was foiled? :: Looks like an awesome product. Plenty of really neat features. :: ...but what about shabbos? Here's something to help the fast go faster. A friend of mine wrote the script, his friends acted it out. It's pretty funny. Laugh out loud funny in a few spots. Enjoy. It all began in 2006 when the late, but famous, Ren Reb posted: Things I think about during magilla reading (besides Russel Crowe). And though she didn't "tag" me (Ren Reb looks, but she doesn't touch) I thought I'd play along. So here, in no particular order, are some of the thoughts that dance through my sugar and caffeine deprived mind during megillah reading. * Why didn't they have co-ed parties in ancient Persia? I mean, how pious were these people, that Vashti and the women were kept separate from Achashveyrosh and the men? And if all that separation didn't help the ancient court of Persia stay proper and moral, why do 21st century Jews think it's worth doing? The song as it should be sung? 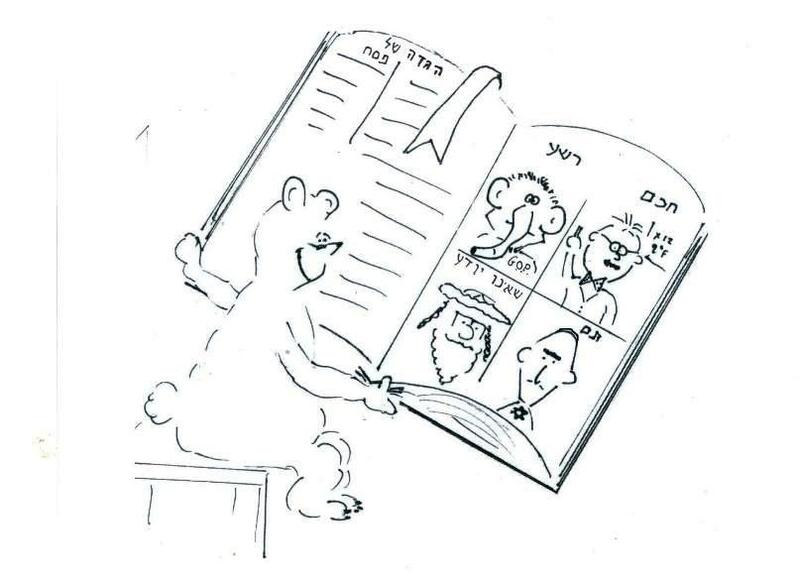 Most of the cartoons are intended as commentary on subjects close to the cartoonist’s heart and personal experience, namely, issues in the Chassidic and ex-chassidic community. But many – perhaps even most -- of them apply equally to any frum or secretly-not-frum and OTD communities and some even apply to the wider conservative milieu. Check us out! Click back to the very beginning. Any questions and discussions on the meaning of the cartoons, its correctness or fairness or ability to drive home the message, and even on the technical execution and merit is welcome in the comments section. We hope to update anywhere from one to three times a week (cartooning is hard!) with fresh never-seen-before material. There will also be caption contests, works done on special request (email us your ideas please), and… nudes. Maybe. See our blog sidebar to: Link us! Like our Facebook page! Follow us on twitter! Follow us on pinterest! We're cool like that. If you like us please send all your friends. If you hate us and think our blog is a horrible experience, please send all your enemies. About Shpitzle, the cartoonist: Shpitzle Shtrimpkind started blogging with her shpitzel headgear (really!) and her offspring deep inside one of the most sheltered and cloistered Satmar communities. But sheended blogging as an educated secular(ish?) woman writing with humor and poignancy of a new life. And now… cartoons! You can read all her old and new writings online to watch the transformation in real time, like some kind of tragicomedy directed by an unholy alliance of Woody Allen and Stanley Kubrick (depending on your point of view). About Shpitzig, the author of these words: nothing. Apparently missing is a hard-core Hasidic edition. Care to provide some suggestions?